CEDIA 2018 may be over but the memories are fresh, especially thanks to a strong showing from projectors, the emergence of 8K, and demos from lots of great-sounding audio systems. Pure power meets precision in a system where the third time turned out to be the charm in terms of nailing a CEDIA demo. The system showcased the company’s Pro-Ribbon speakers that have super-fast transient response and high power handling. New at the show was Alcons CRMS-LFE18 18″ sealed subwoofer that delivers bass down to 10 Hz and below, thanks to 1.2″ peak excursion. The award is for the sheer impact of this system, which put you inside the movie and delivered the physicality needed to create suspension of disbelief while watching a scene from Ready PlayerOne. Easily the most misunderstood, and potentially most significant home cinema technology announcement of the show, IMAX Enhanced is more than just a logo or a certification. It’s a new sound format, and it’s a picture that fills a 16:9 screen with more info. Did you know that widescreen (2.40:1 aspect ratio) movies are vertically cropped to fit the format? It turns out you can show more if the scene when mastering, which uses all the pixels you pay for on 16:9 TVs and projectors. And frankly, it provides a more dramatic viewing experience. 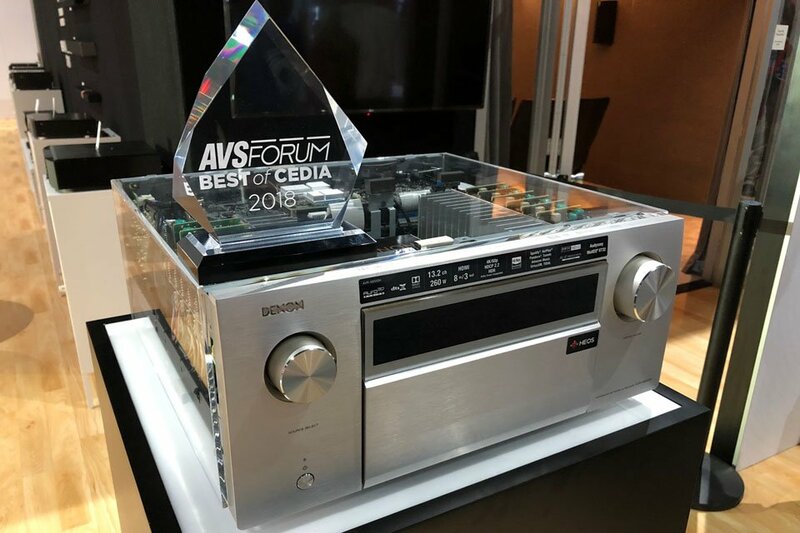 So, for being the first to adopt IMAX Enhanced for it’s AVR and pre/pros, Denon and Marantz get a Best of CEDIA 2018 nod. When Epson demoed the new Pro Cinema 4050, it pointed to the pristine cinematic imagery it puts on a screen. When the $2399 MSRP was announced, it was clear this is a contender in the “best bang for the buck” category. But what really makes this Epson an exceptional introduction is its motorized lens that has horizontal plus vertical shift, zoom and 10 memory presets. Epson’s Pro Cinema 4050’s black levels don’t match those of pricier competition but the feature set, including 4K HDR support, make it a serious contender for movie lovers with modest home theater budgets. It’s an easy and obvious pick for Best of CEDIA 2018 given how much it brings to the table for the price. When what you see on screen is some of the most sublime video you’ve ever witnessed at a show, the need to recognize it is immediately apparent. When I stepped into the JVC 8K e-shift press conference and demo at CEDIA 2018, what I saw knocked my socks off. Granted, a DLA-NX9 or DLA-RS3000 will cost you $18,000, but oh the picture you get! Now, the reality of 8K is the content simply does not exist at this time, aside from specialized clips like the one JVC used at the demo, which was 8K source material on a server. However, even in this case the video delivered to the projector was downscaled to 4K and then processed up to 8K by the projector. There’s no doubt JVC has an enviable track record making projectors that offer unprecedented contrast levels to home viewers. But the one fly in the ointment for videophile home theater enthusiasts was the use of e-shift to get 4K resolution. In 2018 JVC solved the problem with four new native 4K models featuring its class-leading D-ILA technology: The DLA-NX7/DLA-RS2000 ($7,999.95) and DLA-NX5/DLA-RS1000 ($5,999.95). And it’s just in time given how 4K with HDR is gaining significant traction thanks to streaming UHD. Samsung’s Q900R is the first 8K TV consumers will be able to buy in the U.S., which makes it a clear Best of CEDIA 2018 award winner. True, there’s little native 8K content out there aside from high-resolution still photos, but one of the keys to this TV is it leverages the extra pixels and powerful AI Upscaling to present optimized 4K video. And while 8K may be the headline-grabber, the other feature that makes this 85″ QLED interesting to movie lovers is it can output 4000-nit peak highlights. The importance of this is many HDR movies are mastered in HDR at 4000 nits and a TV that can displaythose highlights at that brightness does not have to tonemap. The end result is HDR that looks like the original master. I’ll have a chance to get hands-on time with this exciting TV soon, so stay tuned for that. I genuinely wish I had this product when I reviewed the Sony VPL-VZ1000ES projector, but it did not exist at the time. The Solo by Screen Innovations is a line of motorized screens that are easy to install. Notably, Solo is available in a battery-powered, rechargeable, 100% wireless variant that hangs on a wall with just two screws. And now it’s available in a UST (ultra short-throw) ALR (ambient light-rejecting) version that’s perfect to go with UST projectors. With a UST projector and a UST ALR screen what you get is a huge image that can stand up to ambient light in the room. You wouldn’t necessarily watch Star Wars with the lights on using one of these screens, but you would watch a football game with your friends. The key to UST rigs is the projector is right in front of the screen, so there’s no chance of anyone walking in front of it and casting a shadow. The even makes setting up a UST projector easier than a fixed-frame screen because you can precisely adjust the height/position of the screen area using a remote control. 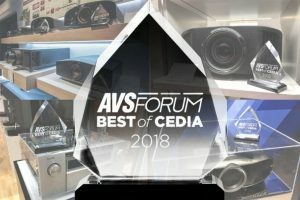 For making life a lot easier if you are getting a UST projector, I’m giving Screen Innovations Solo UST a Best of CEDIA 2018 award. I’m so happy Sonos had the foresight to create the Amp. It’s a new 100 watt per channel amplifier from the company that almost single-handedly created the market for premium lifestyle-friendly wireless streaming audio products. The Amp is a standout because it’s a capable amplifier that sounds good and features an HDMI connection. Yes! Thank you Sonos for treating HDMI as a legitimate way to transfer audio from one device to another. At CEDIA 2018 I heard the Amp drive a pair of B&W 703 S2 towers with a dynamic ease that confirms this is no toy amp. Since its Sonos, it may be used flexibly, as a zone or as a part of a surround system. And with Sonos software always improving the usability of its ecosystem, the Amp looks like its a product with a bright future. 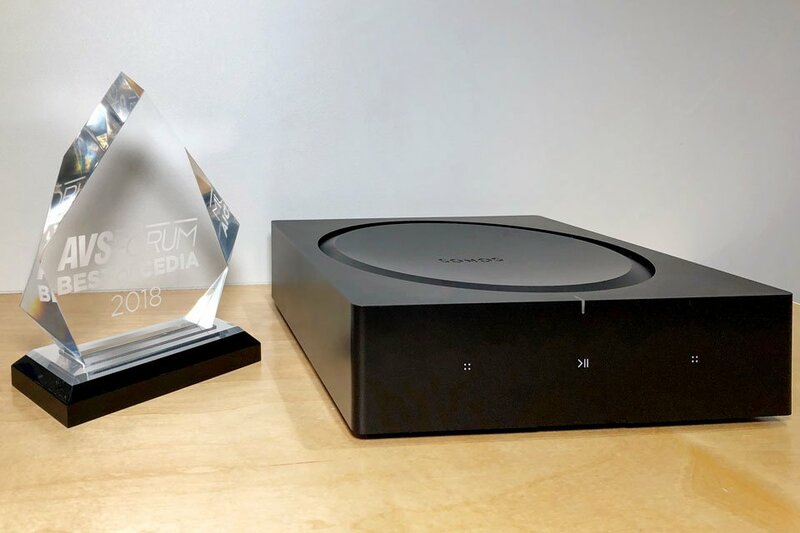 A very obvious choice for Best of CEDIA 2018. Sony’s three new projectors all received a best of CEDIA 2018 award, each one for a different reason. Sony’s newest entry point to native 4K projection is the 1500 lumen VPL-VW295ES, which for the first time offers support for 60p 4K HDR content at the $5000 price point. This projector also features a low input lag 27 ms, which makes it a great choice for gamers seeking a true 4K big-screen experience. 60p 4K support is also great for playing back video captured on phones and cameras that support the format, and watching movies on streaming services where the app does not support 24p. The premium Sony VPL-VW695ES is an 1800 lumen projector that promises a premium experience to its purchaser. It’s packed with performance-enhancing features such as a dynamic iris that allows it to deliver 350,000:1 contrast and a motorized lens that includes memory, for flexible placement and easy switching between aspect ratios. Sony claims a 6000-hour lifespan for the bulb and 1800 lumens of brightness. 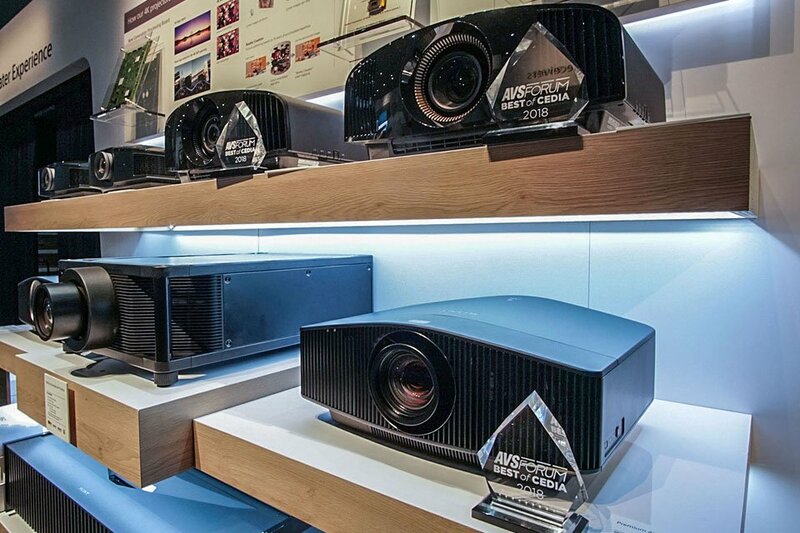 This projector handles 3D HD video and 60p 4K HDR, both of which can be very exciting for gamers. This is an all-around solid projector that sits just under the laser-phosphor light source models in terms of capability at a more affordable price point, hence the Best of CEDIA 2018 award. The VPL-VW99% is a new, reference-quality projector from Sony that builds on the already-impressive VPL-VW885ES. It adds a dynamic iris to the modulated Z-Phosphor laser light source, giving it the ability to render extremely impressive levels of on-screen contrast, allowing it to get the most out of today’s 4K HDR content. I had a chance to preview this projector before CEDIA and it took mere seconds to notice the effect of the new ARC-F (all-range, crisp focus) lens, which is a pro-quality optic design borrowed from the definitive flagship projector in Sony’s lineup, the $60,000 VPL-VW5000ES. Plus, this projector adds a key new technology called Digital FocusOptimizer that’s able to extract maximum resolution from the lens by compensating for optical anomalies that are unavoidable in all lenses. The end result is a projector that casts an image on screen where every single one of the 4K pixels is razor-sharp, from edge to edge and corner to corner. It’s also a nearly silent projector, with 20,000 hours of uninterrupted operation thanks to the laser light source. It’s pretty much going to be a tradition that each year I’ll reserve one Best of CEDIA 2018 award for a soundbar-based system. In 2018, the deserving recipient was obvious: Theory Audio Design blows away all other soundbars with its system that authentically renders the tactile sensations found in today’s modern 3D immersive audio mixes. I can’t say enough positive things about the system demo at the show. First and foremost, the use of a acoustically transparent screen to hide the soundbar was brilliant. You can step inside the room knowing that you’re about to listen to a soundbar, and yet once the demo clip start playing, you’ll totally forget this fact and instead you will just start to believe you’re in the movie. When the audio is this good, suspension of disbelief occurs quite quickly. And while there’s no question a price point of $10,450 represents a sizable investment for a 5.2.2 sound system, you are getting amplification plus DSP processing plus speakers with the package. And I can tell you in no uncertain terms that the end result… what this Theory Audio Design system produces in terms of overall effect would cost at least as much to match using, external amplifiers, subs, and standalone speakers. Make no mistake, this is professional quality home theater sound disguised as a lifestyle friendly, attractive, low profile, soundbar-based system.